Rum and rum cocktails are usually associated with white tropical beaches. Rum cocktail recipes often require tropical fruit and cocktails with rum are usually bright coloured and decorated with these tropical fruits. Rum is another spirit that is very versatile in the world of mixed drinks and combines well with most fruit juices to give a tropical flavour to your drinks. So, this is another perfect opportunity for you to experiment with rum cocktail recipes! You will find that many rum cocktails contain cream, milk or ice cream. Also, many rum cocktail recipes require you to blend the ingredients. Rum is produced in many countries, but mostly on the islands off Central and South America. Jamaican rum is usually dark, Puerto Rican rum is light and Cuban rum can be dark or light or anything in between. Generally, bartenders use light rums in cocktails, but you can use darker rums. If you need to choose, we suggest you go for a lighter rum. TIP: Check out our Cocktail Mixing Guide for an explanation of the terms used on this page. 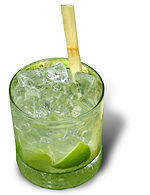 This is Brazil's national cocktail. It's very similar to a Mojito (see below). Preparation:Muddle the lime and sugar in the glass. Fill the glass with crushed ice, and add the Cachaca. Stir. Garnish:Mint leaves or sugar cane. Preparation:Pour the Taboo and Malibu in the glass and top up with Coke. This is likely the most famous and widely drank rum cocktail ever. Many versions of this classic have seen the light. Preparation:Shake the ingredients an strain into the glass. Garnish:Slice of lime and a cocktail cherry on a stick. A variation is to blend the ingredients with crushed ice and serve it “frozen”, especially on a hot day. A sweeter version of the original Daiquiri as described above, which might be more enjoyable for some. Garnish:Slice of orange and a cocktail cherry on a stick. As far as rum cocktail recipes go, this is a Cocktail Mixing Master all-time favorite. A true tropical cocktail. Garnish:Slice of banana. A pineapple slice is also sometimes used. Even more tropical looking and tasting than the Banana Daiquiri. Preparation:Blend the ingredients for a few seconds until its smooth. Fill the glass about one third with crushed ice and strain the blend over it. Garnish:A cherry and cube of pineapple on a stick. Nice refreshing drink for a hot summer’s day. Preparation:Muddle the mint leaves in the glass with the sugar syrup and lime juice. Fill the glass with crushed ice, add the rum and top up with soda water. Stir. Cubans tend to add Angostura Bitters to this drink. As another variant, you can use fresh fruit instead of the mint leaves. Classic cocktail you will find on just about any cocktail menu in the world. Preparation:Blend the ingredients for a few seconds until its smooth and pour into the glass. Vanilla ice cream, about 2 scoops. Delicious, although it will not appeal to everybody. Preparation:Shake the ingredients (without the soda water) and strain into the ice filled glass. Top up with soda water. A “Tom Collins” made with rum instead of gin. Don't miss the Gin Cocktail Recipes Guide after you've visited Rum Cocktail Recipes. Preparation:Shake the ingredients excluding the cola and strain into a glass filled with ice. Top up with cola. This cocktail was created shortly after Coca-Cola was first sold. Garnish:Thin lime or lemon wheel and often served with a stirrer. A classic from the 1930’s and invented in the famous Harry’s New York Bar in Paris. Strong and tasty! Honey-flavoured drink that puts you in a good mood. Garnish:Twist of orange or orange slice. A sour and refreshing summer’s cocktail. Preparation:Shake the first 4 ingredients and strain into the ice-filled glass. Top up with soda water. This is the drink for you if you are a rum lover. A splash of 151 proof rum. Preparation:Shake the ingredients excluding the 151 proof rum and strain into a glass filled with ice. Float the 151 rum on top.